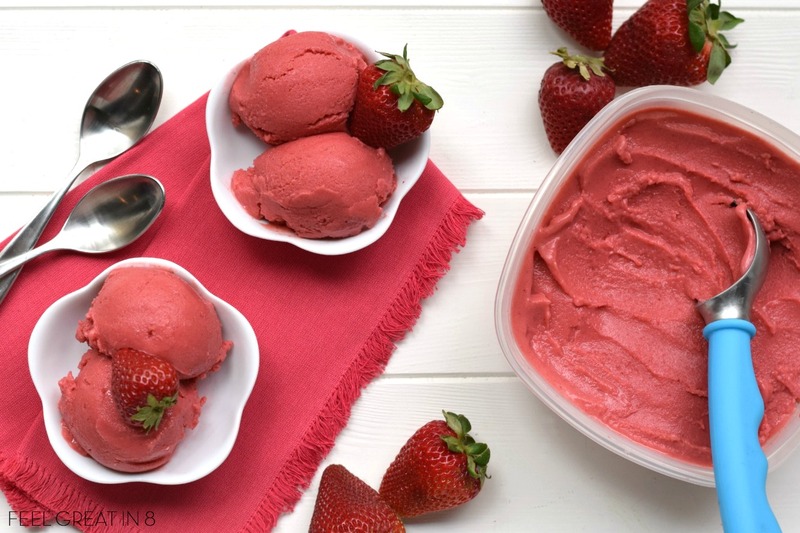 You only need 5 minutes and 4 healthy real food ingredients to make this Homemade Strawberry Frozen Yogurt – No ice cream maker required! At only 100 calories per serving, you’ll love this sweet guilt-free dessert! I’m so excited you are here for this delicious and simple frozen yogurt recipe! Before I tell you more about how awesome it is and give you the recipe, I wanted to make sure you get my new eCookbook – 44 Healthy Recipes with 4 Ingredients or Less! It’s totally free and full of all of my favorite healthy recipes (all with 4 real-food ingredients or less!) CLICK HERE AND I’LL EMAIL YOU A COPY! Are you as excited for summer as I am? I love hot summer days, beautiful red strawberries, and yummy frozen treats! This simple, delicious, healthy dessert just screams summer and you only need a few minutes and a blender to throw it together. Perfect for an afternoon treat, or a quick and easy dessert after dinner. I’ve made this twice in the past few weeks and my family devoured it both times. The first time I made it with frozen strawberries and we ate it instantly. The next time I used fresh strawberries and put it in the freezer overnight. It was super yummy both ways, so go ahead and do whatever works best for you. 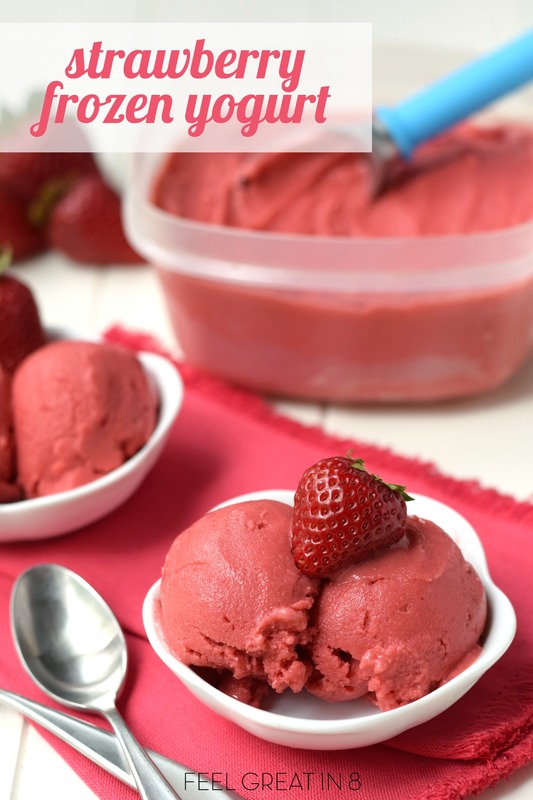 You only need 5 minutes and 4 healthy real food ingredients to make this Homemade Strawberry Frozen Yogurt - No ice cream maker required! At only 100 calories per serving, you'll love this sweet guilt-free dessert! Put all of the ingredients in a blender and blend until smooth. I use and LOVE my Blendtec blender. If you're using a cheaper blender, you may need to add more juice or other liquid, or use fresh strawberries. If you use frozen strawberries you can scoop and enjoy immediately. If you use fresh strawberries, add extra liquid, or if you just want a more solid consistency, pour into a container with a lid and freeze until desired consistency is reached. Then just scoop and enjoy! *Actual nutrition info may vary based on exact ingredients used. 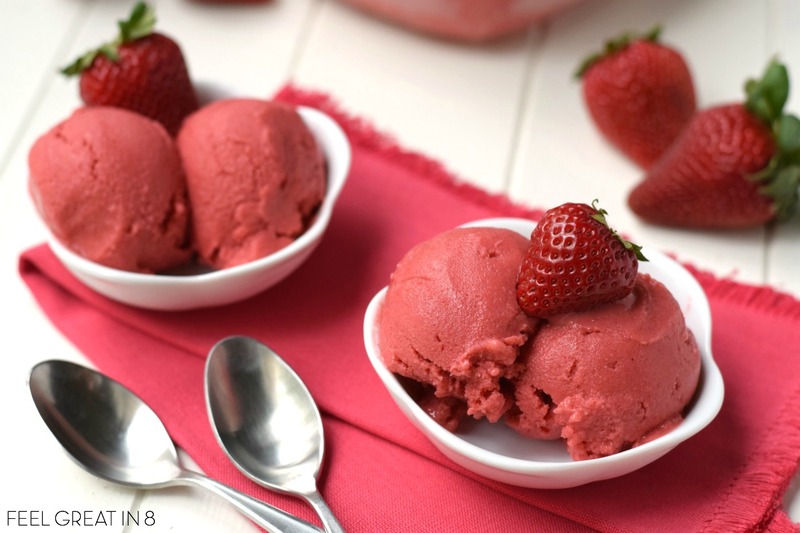 Find this recipe on MyFitnessPal as FG8 Homemade Strawberry Frozen Yogurt. 1. Blendtec Blender: I love, love, love my Blendtec! Getting a powerful blender is definitely an investment, but I use mine at least once a day and I love knowing that the 7 year warranty is there. I actually burned the motor out on my first one and they replaced it no questions asked. I use mine for the usual smoothies and batters, but I also love it for grinding wheat into flour and of course making homemade ice cream and frozen yogurt! You can get one new at Costco or on Amazon for around $350, or you can get one refurbished with the original warranty for $280 from Blendtec right HERE. 2. Frozen Berries: Buying frozen berries is a great way to get delicious, healthy berries even when they aren’t in season. I get big bags at Costco and use them in oatmeal, greek yogurt, as a yummy treat right out of the bag, or in frozen treats like this all the time. 3. Raw Honey: Honey is one of my favorite natural sweeteners. You do have to choose honey carefully though, apparently there are lots of brands that are actually diluted with high fructose corn syrup!? We started buying local raw honey when my oldest was little to help with his season allergies. If you’ve never tried it raw, you should definitely give it a try. You can even get it on Amazon now! * Some links are affiliates. The products cost the same to you, but I get a small commission. I never recommend anything I don’t honestly believe in. Looking for more healthy real food recipes? Recipe looks delish and refreshing especially for summer. Thanks! Can I use raspberries instead?? Even if I use frozen strawberries can I still freeze it to use throughout the week? This is an awesome recipe and so easy to make… Thank you!! You are so welcome Maryann! It looked so good that I ran to the store for some Greek yogurt. I just got finished making it and it has more of a lime tart to it. Is it suppose too? or should I have added a few more strawberries? because I did as close to a cup each as I could with whole berries. that I may have had a few less than I should have. Also is there a reason for the lime juice being in there? Just to add a little flavor, but you are welcome to leave it out if it isn’t your favorite. Do you use fresh lime juice or from a container? Could I make this without honey? Hi Hannah! Any sweetener would work fine. Can I omit all sweeteners? Can I use this recipe to make other fruit flavoured oce cream, e.g. Blueberries or forest fruit? I can’t wait to try this with Blueberries! Total treat for us! Thanks a lot. Sounds delicious Beth! Hope you enjoy it! can i use fresh strawberries? Absolutely, you’d just either need to freeze them first, or allow more time for the frozen yogurt to freeze after blending. I just made this… it’s delicious. Thank you for sharing. I just made this and added vanilla, blueberries, and watermelon as well! had to add a splash of milk so that it would blend nicely, and then just put it in the freezer to bring it to the right consistency! I added some fruit on top just for some nice garnishing and it turned out great!! Super easy thanks for the recipe! My frozen yogurt is frozen solid after one night in the freezer. Is there a secret to getting a serving out without having to thaw the whole batch? Hey Kerry! Give it a few minutes and then heat your ice cream scoop under hot water. Enjoy! Hi Lena! Yep, regular honey will work great! Hey there! I recently tried a recipe similar to this, but when I blended it, it ended up very liquid-y and almost like a smoothie. Put it into the freezer and it came out as a delicious, strawberry flavored block of ice. lol Nothing yogurt/creamy about it. Any ideas as to where I went wrong?? Cause I’d love to get this right! My daughter hates when the little “seeds” are left from the strawberries or raspberries, do you have any tricks to make it less “seedy” your pictures don’t really show any remains of the seeds. Hey Kimberly! I don’t feel like I usually have the seed issue with strawberries, but raspberries tend to leave a bunch. One idea would be to poor your mixture through a fine mesh strainer before freezing. I’ve done that before when making fruit popsicles for my kids.